Welcome to the NBA Fantasy Playoffs — your shot at the NBA Finals. But just like the rest of the league, you’ll have to earn your ticket there. Win any FREE qualifier contest, and you’ll advance to Round 2 — the NBA Fantasy Finals on May 20th— where you’ll square off against other aspiring champs for a chance to win a trip to an NBA Finals game. Each NBA Fantasy Playoffs contest is focused on a single NBA playoff game. Every contest uses our “single game” NBA game style, with a more flexible, 5-player roster format. So you only need to focus on one featured NBA game per night. Welcome to the 2019 NBA Fantasy Playoffs (“NBAFP”). The NBAFP will take place solely through the Official One-Day Fantasy Game of the NBA hosted by FanDuel at fanduel.com/nba-fantasy-playoffs. The NBAFP will consist of thirty (30) Official NBA One-Day Fantasy Basketball Contests (“Qualifiers”) and one (1) NBAFP Tournament Finals Contest (“Finals”). The Qualifiers will run on thirty (30) days between April 13, 2019 through May 14 2019, and the Finals will take place on May 20, 2019. The date of the Finals is subject to change based on the NBA Conference Finals schedule. Participants may enter each Qualifier through the contest landing page, available here: http://fanduel.com/nba-fantasy-playoffs. All Qualifiers are single entry contests and no entry fee is required to enter. Any instance of registering multiple accounts on FanDuel in order to gain more than one entry into a Qualifier will result in automatic disqualification from the Qualifier and the NBAFP as well as potential suspension from FanDuel. Each Qualifier will award prizes to participants in the top 1,820 position levels (“Winners”) pursuant to the prize table below. The first place winner of each Qualifier will gain one (1) entry into the Finals (“Finalist”). Exact prizing will be specified in the entry screen for each day’s Qualifier. In the event a prize is unavailable, FanDuel will use its sole discretion to provide the winner with a suitable alternate prize. FanDuel will set the maximum number of participants prior to each Qualifier. All prizes are non-transferrable. NBA Store Gift Cards will be provided in the form of promo codes sent via e-mail to respective Winners. Winners of a free entry into a FanDuel contest will see their contest ticket on their Vouchers page within 24 hours of winning the prize. 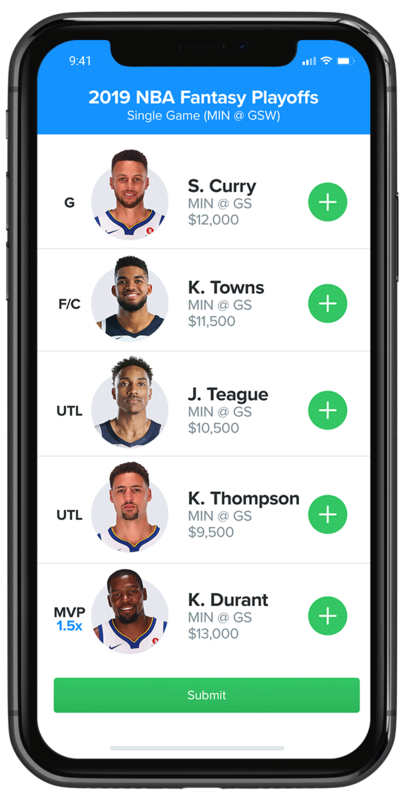 Players awarded a contest ticket by FanDuel are responsible for redeeming their voucher before the contest starts and setting their preferred lineup into the contest. Users physically located in Alabama, Arizona, Hawaii, Idaho, Iowa, Louisiana, Montana, Nevada, Texas and Washington (“Restricted States”) are not eligible to receive free entry into paid fantasy contests on FanDuel and will instead receive the ARV equivalent of the prize in cash in lieu of the free entries. The Finals will award prizes to participants in the top 30 position levels pursuant to the prize table below. The first place winner of the Finals will be deemed the Grand Prize Winner. The second through third place finisher of the Finals will be deemed the 2nd-3rd Place Winner. The fourth through tenth place finishers of the Finals will be deemed the 4th-10th Place Winners. The 11th through 30th place finishers of the Finals will be deemed the Additional Winners. In the event a prize is unavailable, FanDuel will use its sole discretion to provide the winner with a suitable alternate prize. All prizes are non-transferrable. The Grand Prize Winner will receive the NBAFP Finals Grand Prize (“Grand Prize”), comprised of a trip for two (2) to a game of the 2019 NBA Finals presented by YouTube TV as well as a VIP NBA Finals presented by YouTube TV Experience. Grand Prize includes a $1,000 airfare credit to book round-trip airfare to the NBA Finals presented by YouTube TV Game, double-occupancy hotel accommodations for one (1) night for winner and one (1) guest, and two (2) game tickets to an NBA Finals presented by YouTube TV game. Approximate Retail Value (“ARV”) is up to $6,000.00. Actual value depends on city/day/time of departure. Any difference between stated value and actual value will not be awarded. Winner must book and pay for their flights within 2 days of cash being deposited into their account. FanDuel will not provide more cash than initially deposited; winner will be responsible for any change in airfare from time of deposit to booking. Guest must be of legal age of majority in his/her jurisdiction of residence (and at least 18) unless child or legal ward of winner. Winner and guest are responsible for obtaining all necessary travel documents prior to travel. Trip must be taken on dates and times designated by FanDuel or prize will be forfeited in its entirety and may be awarded to an alternate winner. In the event that the Grand Prize winner or his/her guest are unable to obtain proper travel documents prior to departure date, the Grand Prize winner in question will forfeit the Grand Prize in its entirety and the Grand Prize may be awarded to an alternate winner. If the NBA Finals presented by YouTube TV game is canceled or postponed for any reason, prize will be awarded less applicable travel-related activity(s) and Sponsor will substitute that activity(s) with an item(s)/activity(s) of comparable or greater value as determined solely by FanDuel and no additional compensation or prize will be awarded to winner in such event. Winner and guest must comply with arena rules and regulations. Failure to do so may result in forfeiture of applicable prize element. Exact seat locations at game to be determined by FanDuel in its sole discretion. All prize details are at FanDuel’s sole discretion. Certain travel restrictions may apply. The Second and Third Place Winner will receive the NBAFP Finals Second Place Prize (“Second Prize”), comprised of a trip for two (2) to the 2019 NBA Draft as well as a VIP NBA Draft Experience. Second Prize also includes a $1,000 airfare credit to book round-trip airfare to Brooklyn, New York and double-occupancy hotel accommodations for one (1) night for winner and one (1) guest. Approximate Retail Value (“ARV”) is up to $5,000.00. Actual value depends on city/day/time of departure. Any difference between stated value and actual value will not be awarded. Winner must book and pay for their flights within 2 days of cash being deposited into their account. FanDuel will not provide more cash than initially deposited; winner will be responsible for any change in airfare from time of deposit to booking. Guest must be of legal age of majority in his/her jurisdiction of residence (and at least 18) unless child or legal ward of winner. Winner and guest are responsible for obtaining all necessary travel documents prior to travel. Trip must be taken on dates and times designated by FanDuel or prize will be forfeited in its entirety and may be awarded to an alternate winner. In the event that the Second Prize Winner or his/her guest are unable to obtain proper travel documents prior to departure date, the Second Prize winner in question will forfeit the Second Prize in its entirety and the Second Prize may be awarded to an alternate winner. If the NBA Draft is canceled or postponed for any reason, prize will be awarded less applicable travel-related activity(s) and FanDuel will substitute that activity(s) with an item(s)/activity(s) of comparable or greater value as determined solely by FanDuel and no additional compensation or prize will be awarded to winner in such event. Winner and guest must comply with arena rules and regulations. Failure to do so may result in forfeiture of applicable prize element. Exact seat locations at Draft to be determined by FanDuel in its sole discretion. All prize details are at FanDuel’s sole discretion. Certain travel restrictions may apply. The 4th-10th Place Winners receive two (2) tickets to a regular season 2019-20 NBA game in anyone one (1) team market (to be determined by FanDuel). Travel to and from game is not included and is each winner’s sole responsibility. Tickets are subject to terms and conditions specified thereon. Seat locations will be determined by FanDuel. For the Gift Codes subject to terms, conditions, and restrictions as specified by issuer, all of which must be complied with by winners. Prize details are subject to change at FanDuel’s sole discretion. Prizes are awarded “as is” without warranty or guarantee either express or implied by FanDuel. Any and all warranties and/or guarantees (if any) shall be subject to the manufacturer’s terms therefore (each winner agrees to look solely to such manufacturer for any such warranty and/or guarantee, if any). FanDuel does not make any warranty, representation, or guarantee, express or implied, in fact or in law, relative to any prize, including but not limited to its quality, mechanical condition or fitness for a particular purpose. In the event a prize is unavailable, FanDuel will use its sole discretion to provide the winner with a suitable alternate prize. All prizes are non-transferrable. Each Qualifier and the Finals follows FanDuel’s standard scoring rules for fantasy basketball contests. You can find all scoring rules at https://www.fanduel.com/rules. In the event of a tie for first place in a Qualifier or for any prize other than NBA Store Credit in the Finals, the tied players will play a one-day 'playoff' fantasy basketball contest administered by FanDuel to determine finishing position. The playoff contest will follow FanDuel’s standard scoring rules for fantasy basketball contests. In the event of a tie for an NBA Store Credit, players will receive the split value of the Store Credit. All other ties will result in the tied players receiving the split cash value of the related prizes, which will be determined by FanDuel at its sole discretion. For example, if there is a three-way tie for 2nd, 3rd, and 4th position, FanDuel will provide each participant with a prize that is one-third the of aggregate value of the original prizes. Employees, officers, and directors of FanDuel and its respective parents, affiliates, subsidiaries, and family members living in the same household of such employees are not eligible to participate in the NBAFP. NBA Properties, Inc., the National Basketball Association (the “NBA”), and the NBA member teams is defined as collectively (“NBA Entities”). Employees, officers, directors, representatives and agents of FanDuel Inc., NBA Properties, Inc., Turner Digital Basketball Services, Inc., NBA Media Ventures, LLC, the National Basketball Association and its member teams and each of their respective parent companies, subsidiaries, affiliates, officers, governors, owners, wholesale distributors, retailers, advertising/promotion agencies (collectively, “Released Parties”), Panini America, Inc., and the immediate family members (parent, spouse, sibling or child and their respective spouses, regardless of where they reside) and those living in the same household of each, whether or not related, are not eligible to participate or win a prize in the NBAFP. Void in Puerto Rico, and all territories and possessions of the United States and where prohibited by law. The NBAFP is subject to all federal, state and local laws and regulations. The Grand Prize Finals Winner, Second and Third Prize Winner, and 4th-10th Place Winners will be notified via email within ten (10) business days following the completion of the Contest. The Winners may be required to submit valid identification (in a form determined by FanDuel in its sole discretion) to the Released Parties and may be required to execute and return, within three (3) days of issuance, an Affidavit of Eligibility, Liability and Publicity Release (unless prohibited by law) or Prize claim form depending on the prize level. Any of the following may result in disqualification and, at FanDuel discretion and time permitting, the prize may be awarded to runner up (as applicable): failure to return such documents within the specified time period, noncompliance with these Terms and Conditions or the FanDuel Terms and Conditions, the return of any prize or prize notification and if any potential winner declines a prize for any reason. Grand Prize Winner and Second Finals Winner agree that their full names, location and/or photos and videos can be used for marketing purposes. They also agree to speak to bloggers and other journalists and media personnel where applicable prior to, during and after the experience, and they agree to participate in additional FanDuel marketing activities, all without additional compensation. Any winner unprepared to adhere to this requirement will have their finishing position swapped with a runner up in that contest. In regards to the “NBA Entities”, participants in this promotion agree to be bound by these NBAFP terms and agree that the NBA Entities and their designees and assigns may use the participant’s name, voice, city/state of residence, photos, video or film clips, and/or other visual likeness for advertising and/or trade purposes and/or for any other purpose in any media or format now or hereafter known without further compensation (financial or otherwise), permission or notification. FanDuel may require NBAFP participants to sign the below Affidavit of Eligibility to confirm their identity and eligibility. Any participant refusing to sign the Affidavit of Eligibility upon FanDuel’s request will be disqualified from the NBAFP and ineligible to receive any prizes. I represent that the information provided above is accurate and complete. I am over 18 years of age (21+ if in MA). I agree to provide government-issued photo identification to FanDuel to verify my identity and date of birth. I agree to refrain from any behavior or communication during any NBAFP promotion that would harm the image or reputation of FanDuel, the NBA, or the FanDuel user community. If I win the Grand Prize, I will participate in the following, without requesting additional compensation from FanDuel or any third party: At FanDuel’s request, I will speak with any interested bloggers and other journalists and media personnel at the NBA Game I attend, including when such personnel are recording the conversation for publication. At FanDuel’s request, I will participate in a specified number of other hours of any FanDuel marketing-related activities that FanDuel organizes (whether during a NBAFP or otherwise, at FanDuel’s discretion), such as participating in FanDuel marketing photo shoots or interviews with the media, and I agree that my local travel to and from such activities will take place at my own expense and will not count toward the hour total. I agree to be available for these marketing-related activities from 30 days before until 360 days after it. FanDuel, its service providers and “NBA Entities” may take photos or videos of me or in which I appear (“Images”) during the events and activities described in this Affidavit of Eligibility. I grant FanDuel and “NBA Entities” ownership of any copyright or other rights I may have in the Images. I grant FanDuel and “NBA Entities” an irrevocable, perpetual and unrestricted right to publish, distribute, copy, perform and otherwise use in any manner the Images and derivative works thereof, in conjunction with my own or a fictitious name, or without any name, in any medium, and in all media now or hereafter known, including over the Internet, for promotion, advertising, trade or commerce, or for any other purpose whatsoever. I also grant FanDuel and “NBA Entities” an irrevocable, perpetual and unrestricted right to publish and otherwise use my name for such purposes, whether or not in connection with the Images. I consent to the digital compositing or distortion of the Images, including any changes or alterations as to color, size, shape, perspective, context, foreground or background or associated audio. I also consent to the use of any published matter in conjunction with such Images. I waive any right that I may have to inspect or approve the finished product or products and the advertising copy or other matter that may be used in connection with the Images or my name or the use to which they may be applied. I release and discharge FanDuel, its service providers, “NBA Entities” and assigns from any liability in connection with their use of the Images or my name, including without limitation any claims for libel or violation of any right of publicity or privacy. FanDuel, the NBA Entities and each of their respective parent companies, subsidiaries, affiliates, officers, directors, employees, governors, owners, distributors, retailers, agents, assignees, advertising/promotion agencies, representatives, and agents shall have no liability and will be released and held harmless from any claim, action, liability, loss, injury or damage, including, without limitation, personal injury or death to winner or any third party or damage to personal or real property due in whole or in part, directly or indirectly, by any reason, including the acceptance, possession, use or misuse of the prize and/or participation in this promotion. This grant of rights is binding upon me and my heirs, estate, legal representatives, and assigns. FanDuel may request US resident prize winners to provide address and social security details prior to receiving their prize if their prize exceeds $600 in value. Winners are responsible for paying all taxes, fees, registration and insurance, for any prizes won in connection with this contest, including non-cash prizes. The decisions made by FanDuel management regarding, but not limited to, eligibility, winners, scoring, rules, prizes and compliance is in accordance with FanDuel’s standards of conduct. No correspondence will be entered into. FanDuel reserves the right to make reasonable changes to these terms, (a) to ensure the fairness of competition, and (b) in response to unanticipated developments (including, but not limited to, technical failures, errors, acts of God, natural disasters, terrorism, changes in applicable law, delay of NBA season, failure of stats provider and failure to obtain a minimum number of entrants). By participating in the NBAFP, you agree that FanDuel may provide your name and e-mail address to the NBA and that the NBA may use this information for marketing and advertising purposes in accordance with its own policies. By playing the Contest, each participant accepts and agrees to accept and be bound by these Terms and Conditions and by the decisions of the FanDuel, which shall be final and binding in all respects. No transfer, assignment, cash redemption, or substitution of prize (or portion thereof) is permitted except by FanDuel who reserves the right to substitute a prize (or portion thereof) with one of comparable or greater value as determined by FanDuel. The Released Parties and their parents, affiliated and subsidiary companies and advertising and promotion agencies are not responsible for lost, incomplete, inaccurate, garbled, late, delayed, undelivered or misdirected downloads, installations, registrations, usernames, scores, NBA player selections or revisions; theft, destruction or unauthorized access to, or alteration of, NBA player selections; failures or malfunctions of phones/mobile devices (including wireless phones/handsets or other wireless devices), phone lines or telephone systems; interrupted or unavailable network/mobile app, server or other connections; any error, omission, interruption, defect or delay in any transmission or communication; traffic congestion on the Internet or for any technical problem, including, but not limited to, any injury or damage to participant’s or any other person’s computer or mobile device related to or resulting from participation in this Contest; errors or ambiguity in these Terms and Conditions, in any Contest-related advertisements or other materials; the selection or announcement of potential winners or the distribution of prizes; the cancellation, suspension or preemption of NBA games, injuries or other unavailability of players, scoring tabulation or timing errors or other problems or errors of any kind whether mechanical, human, electronic, typographical, printing or otherwise. By entering, each participant agrees that the Released Parties and their parents, affiliated and subsidiary companies and advertising and promotion agencies shall have no liability and will be held harmless by participant for any claim, action, liability, loss, injury or damage (1) to participant or any other person or entity, including, without limitation, personal injury or death to participant or any other person or damage to personal or real property, due in whole or in part, directly or indirectly, by reason of the acceptance, possession, use or misuse of any prize and any travel or travel-related activity thereto or participation in the Contest, and (2) any and all taxes and other fees applicable to the prizes received by the prize winners. The Released Parties, in their sole discretion, reserve the right to: 1) disqualify any person (and void his/her points) who tampers with the submission process, the operation of the Contest, or any other component the Contest, or who is otherwise in violation of these Terms and Conditions; and 2) modify, suspend or terminate the Contest (or any portion thereof) should virus, bugs, non-authorized human intervention or other causes, including but not limited to war, strikes, and/or acts of God, corrupt or impair the administration, security, fairness or proper play of this Contest. The Released Parties reserve the right to halt or modify the Contest at any time during the Contest Period if events beyond its control compromise the Contest’s fairness or integrity. CAUTION: ANY ATTEMPT BY A PARTICIPANT TO DELIBERATELY DAMAGE ANY WEB SITE OR UNDERMINE THE LEGITIMATE OPERATION OF THE CONTEST IS A VIOLATION OF CRIMINAL AND CIVIL LAWS AND SHOULD SUCH AN ATTEMPT BE MADE, RELEASED PARTIES RESERVE THE RIGHT TO SEEK ANY AND ALL REMEDIES AVAILABLE FROM ANY SUCH PARTICIPANT TO THE FULLEST EXTENT PERMITTED BY LAW. The Released Parties reserve the right to modify these rules for clarification purposes without materially affecting the terms and conditions of the Contest. This is a Contest designed to increase consumer awareness of and interest in the Released Parties’ service. In the event that the Contest is challenged by any legal or regulatory authority, Released Parties reserve the right to discontinue or modify the Contest, or to disqualify participants residing in the affected geographic areas. In such event, the FanDuel shall have no liability to any participants who are disqualified due to such an action. In the event of any ambiguity(s) or error(s) in these Terms and Conditions, the Released Parties reserve the right to modify these Terms and Conditions for clarification purposes or to correct any such ambiguity or error(s) without materially affecting the terms and conditions of the Contest. No purchase or payment of any kind necessary. Purchasing will not increase your chances of winning. This game may not be used to conduct, advertise or promote any form of gambling.